We Hit Amazon Best-Seller List With “Get With The Program”! Helena Duzenski, David Duzenski, Danielle Kane and Brian Kane, owners of Evolution Fitness, recently joined a select group of leading fitness experts from across The United States and Canada to co-write the book titled, Get With The Program: The World’s Leading Fitness Experts Reveal Their Best Workouts to Help You Get Lean, Happy and Healthy in No Time Flat! The book was released on September 19, 2013 by CelebrityPress™ – a leading business book publisher. In this book, the title Get With The Program has a particularly important meaning for readers. The Celebrity Experts® who have written this book all wish you to enjoy great health. With time at a premium for the typical reader, they show you various programs and methods to follow in order to improve or maintain your good health. Working with clients who come to them in varying states of health and conditioning, these health and fitness coaches, the very same Celebrity Experts® have developed successful programs. Their clients range from professional and student athletes, as well as busy executives and retirees, all the way to pregnant-moms. On the day of release, Get With The Program reached best-seller status in four Amazon.com categories – reaching as high as #1 in the “Quick Workouts” category. The book also reached best-seller status in the “Exercise & Fitness,” “Weight Loss Diets” and “Diets & Weight Loss” categories. After such a successful release, Helena Duzenski, David Duzenski, Danielle Kane and Brian Kane were recognized by The National Academy of Best Selling Authors™, an organization that honors authors from many of the leading independent best-seller lists, receiving the Quilly Award. The four also received Editor’s Choice for their chapter, entitled “The Evolution of the New You.” Their chapter focuses on the 7 main elements necessary to successfully change your lifestyle from unhealthy to healthy and includes nutrition, exercise, and mindset advice and information. 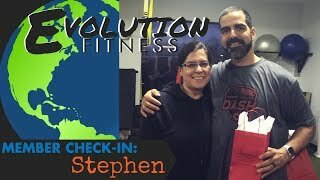 It follows the success story of Evolution Fitness member and Cherry Hill resident, Christine Rohr and we learn how these 7 elements were instrumental to her success, just as they will be for the readers. To learn more about Evolution Fitness call (856) 751-1300.